RALEIGH, N.C. (AP) — Andrei Svechnikov long dreamed of scoring his first NHL goal. It could not have come at a better time for the Carolina Hurricanes. 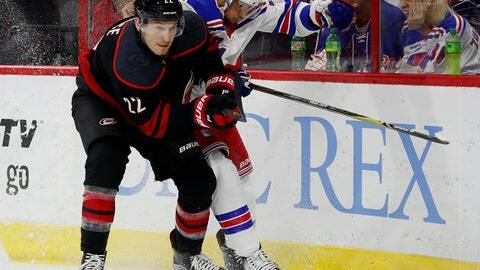 Warren Foegele had two goals and an assist, Svechnikov got his first career goal to snap a tie midway through the third period, and the Hurricanes rallied to beat the New York Rangers 8-5 on Sunday. Svechnikov, the No. 2 overall pick in June’s draft, deflected Justin Faulk’s shot in front of the net with 9:16 remaining to break a 5-5 tie and give the Hurricanes their first lead. Foegele followed with his second goal 47 seconds later and Teuvo Teravainen added an empty-netter to secure Carolina’s first home win under new coach Rod Brind’Amour. Svechnikov’s go-ahead score was one of four unanswered goals by the Hurricanes in the third period as they erased a 5-4 deficit. Lucas Wallmark scored the tying goal for the Hurricanes with 14:59 left. Jordan Martinook, Jordan Staal and Micheal Ferland also scored and Justin Williams had three assists for Carolina. The Rangers had leads of 2-0, 3-2, 4-3 and 5-4 and failed to hold each of them. The teams combined for four goals in each of the first two periods and were tied 4-4 heading to the third. Vesey and Kreider scored on the Rangers’ first two shots of the game, only to have the Hurricanes battle back. Foegele and Martinook scored to pull the Hurricanes into a 2-2 tie by the end of the first. Vesey again opened the scoring with a quick goal in the second, and again Carolina responded. Just as the Hurricanes killed off a 4-on-3 power play, a long pass from Jaccob Slavin and chip ahead from Foegele set Staal loose on a breakaway, and the Carolina veteran forward finished it off a vicious wrister over Georgiev’s blocker. Buchnevich gave the Rangers the lead once again in the second when he stuffed home a rebound on a power play, but a critical mistake by Georgiev allowed the Hurricanes to tie it back up in the final seconds of the period. As the clock moved under a minute, the Rangers’ goalie left his crease to try and clear a puck out of the corner. His clearing attempt went right to Ferland at the point, and Ferland flipped a wrister over Georgiev’s shoulder as he raced back to his net, making it a 4-4 game with 31 seconds left in the second period. It was more of the same in the third. Kreider gave the Rangers the lead again, only to have Wallmark tie it 35 seconds later. This time though, the Hurricanes charged ahead, taking their first lead on Svechnikov’s tally and piling on from there. When the final buzzer sounded, the entire Hurricanes team lined up along the blue line, began clapping over their heads in synch with the crowd, and then raced down the ice and jumped into the boards behind the net in celebration, bringing the crowd to a frenzy. NOTES: The game marked the first time in Whalers/Hurricanes franchise history the team overcame four separate deficits to win. … Vesey has more goals (six) and points (eight) against the Hurricanes than any other team in his career. … Hurricanes F Martin Necas recorded his first career point with an assist on Foegele’s first-period goal. … The Rangers swept the season series against the Hurricanes last season 4-0-0. … Hurricanes F Staal and Rangers D Marc Staal are brothers and alternate captains for their respective teams. … The Hurricanes scratched D Haydn Fleury and F Valentin Zykov. … The Rangers scratched F Vinni Lettieri, F Cody McLeod and D Fredrik Claesson. Rangers: Host San Jose on Thursday night. Hurricanes: Host Vancouver on Tuesday night.